It will come as a surprise to few readers that financial services is Australia's largest industry, contributing around 9% of Australia's GDP. Equally, both the superannuation system's pride of place within this industry (with $1.85 trillion under management, the world's fourth largest superannuation market) and the spectacular growth of the self managed superannuation fund (SMSF) sector (total assets of $594 billion in March 2015 compared to $355 billion in June 2010) are well known and understood. In that context, the almost continuous regulatory review of the industry and SMSF sector in particular is also no surprise. But the ceaseless debate also presents its own risks. The competing claims and counter-claims of various interest groups and industry sectors can generate an overwhelming noise. This noise can make it difficult to spot the real and present dangers in the sector. What's more, whilst there is always a valid argument for principled, forward-looking regulation to head off future crisis, this should not come at the expense of the really pressing current issues. This article focuses on the current issues in SMSF allocation in the light of the most recent ATO statistics on the sector. The conclusions are surprising, at least to those who haven't been tracking these allocations over the last five years. However, as a matter of fact, the conclusions today are virtually the same as they would have been had this article been written in 2010. This, of course, means that for better or for worse, SMSF asset allocation has been remarkably stable over time. Before we start, we should first understand the limitations of this discussion. First, our analysis depends on the quality of the statistics we are considering. There are significant limitations with the ATO SMSF data that must be borne in mind. One example is the shortcomings on the 'overseas investments' statistics, which can overlook international investments via collective investment vehicles like managed investments schemes, listed investment companies and exchange traded funds. This will be discussed further below. The second is the "flaw of averages". ATO statistics are aggregated. Few, if any, individual SMSFs reflect the asset allocation of the sector. The trustees of each fund will therefore continue to face their own individual asset allocations strengths and weaknesses. That said, the benefit of relying on the hard data - noting its limitations - is that we take the subjective element off the table and can therefore focus both on the trees and the woods. The first issue that has been discussed at some length is whether SMSFs are over-exposed to property, or perhaps just to residential property. This issue can be disposed of quickly. 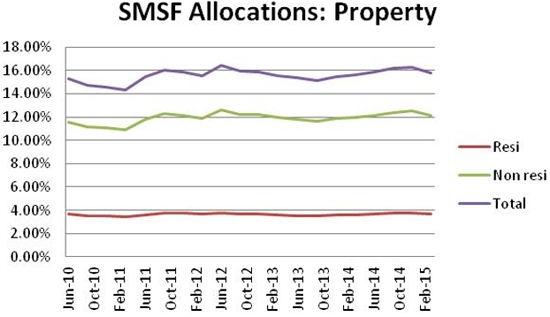 As the graph below shows, SMSF property allocations have been remarkably stable over five years, ranging between around 14% and 16%. Whether one is speaking of residential or non-residential property, the story over the period is one of great stability in allocation. What's more, this exposure seems relatively consistent with the approach of large superannuation funds, with their teams of asset consultants and highly paid industry experts. For example, Australia's largest superannuation fund, Australian Super, reports an exposure to direct property in its 'balanced option' of 9%. When this exposure is considered in the light of exposures to other, arguably related asset classes that SMSFs generally cannot access, like infrastructure (13%), the SMSF allocation looks very reasonable. The notion that SMSFs are being overexposed to residential property (or are a significant contributor to an alleged housing bubble) also looks very shaky. 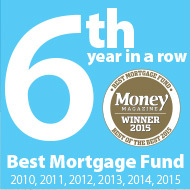 SMSFs hold around 4% of total assets in residential property and have done for five years. There is no sign of a 'boom' in exposures and when current exposures are considered as a proportion of the total housing market ($21.8 billion out of a circa $3 trillion asset class) all sting is taken from the argument. 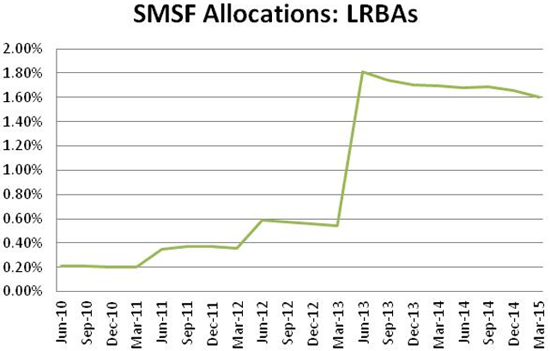 The exposure of SMSFs to borrowing through Limited Recourse Borrowing Arrangements (LRBAs) has been perhaps the most controversial issue in the sector. But do the statistics support the fuss? First, recall that these borrowings are generally taken out to purchase assets, particularly property (both commercial and residential). Then remember that these SMSFs could invest without controversy in a geared property trust. Given that, is it so unreasonable that SMSF trustees could make an investment decision in which they manage the gearing arrangements themselves? One would, of course, wish to avoid abuses and ASIC has been working hard at weeding unscrupulous professionals out of the industry. One would also perhaps argue that an LRBA is a tool for a sophisticated investor. But with current exposures sitting at around 1.6% and declining, are there really signs that this is a substantial issue for the sector? NB: the apparent spike in LRBAs is June 2013 was largely caused by a change in the way the ATO collected statistics, rather than a sudden change in the underlying trend. It is frequently argued that SMSFs are severely underexposed to overseas assets. ATO figures support this assertion, putting overseas exposures across asset classes at just 1%. However, there are very good reasons for suspecting that these substantially understate overseas exposures because of the way that the ATO categorises the data. Most individual SMSF exposures to international investments are made through investment vehicles, like managed investment schemes, LICs and ETFs. All of these would be categorised by the ATO as being domestic investments. Getting accurate figures is difficult. A number of SMSF administrators produce regular reports that show exposures to international equities. Based on those, an estimate of 10-15% seems broadly to be the ballpark, noting that it is always difficult to asset international exposures in multi sector funds and similar vehicles. So the problem may not be as pronounced as is generally argued. 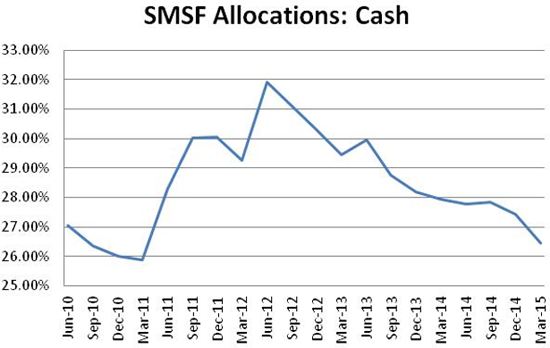 What are SMSFs doing with cash? SMSF cash allocations are a frequent hot topic and rightly so. 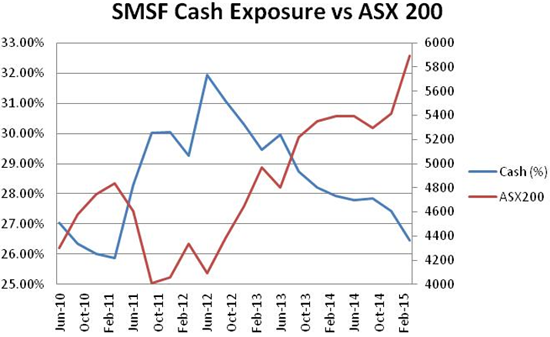 The tendency has been to criticise SMSFs for over-exposure to cash, although this may not be entirely fair. Allocations have fluctuated over the five year period between 26% and 32%. This compares with an exposure of 3% (range: 0%-15%) for the Australian Super 'balanced option', although the more conservative 'stable option' has 24% in cash (range: 0%-50%). Clearly, SMSF trustees are placing a high value on capital stability and regular, reliable income. Inarguably, cash has long delivered capital stability for Australian investors, so this part of the argument is hard to fault. It is the second limb of the argument - reliable income - that current circumstances suggest requires some analysis. The RBA tracks retail interest rates on a number of bases. 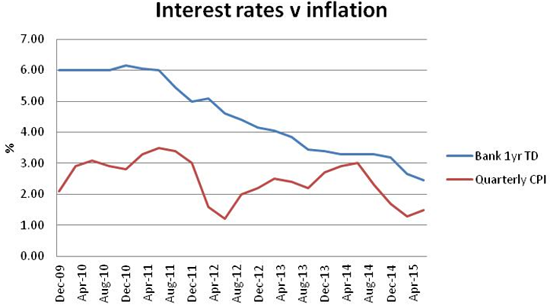 The graph below shows the spread between one year bank term deposits and quarterly inflation (CPI) prints. Whilst healthy margins were available five or so years ago, the margin now is so narrow as to mean that interest rates are barely positive in real terms. The second issue for SMSF trustees to consider in reviewing their cash allocations is how these allocations change over time. As the graph below shows, there is a genuine negative correlation over time between cash exposures and stock values. That is, cash exposures decrease (implying increased portfolio risk) as stock values increase and, arguably, themselves become subject to higher risk. SMSF trustees should consider whether this correlation is indicative of an unintended, perhaps unconscious, 'risking up' of portfolios at the very time that market risk is increasing. 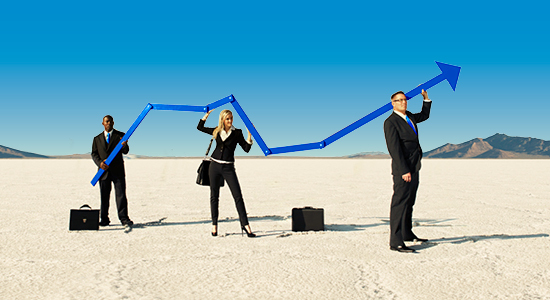 For capital stability, cash has and continues to be an effective investment for SMSF trustees. However, care needs to be taken to ensure allocation levels are reviewed constantly and referred back to the overall investment objectives and risk profile of the SMSF. Cash is not delivering significant real returns for investors. Given long term global interest rate expectations, it is unlikely to do so for an extended period. SMSF trustees seeking income need to consider other options. This will present challenges. As we have previously discussed, the ‘equities for income’ trade is crowded and talk of bond bubbles persists. Trustees should be considering alternative yield plays. La Trobe Financial’s investment objective is to deliver reliable yield for investors via Australia’s largest peer to peer investment scheme and award-winning Pooled Mortgages Option – currently paying 5.40% for a twelve month investment. We will discuss the domestic and international economy, with our “headwinds and tailwinds” analysis. We will also update you on the Australian property market and values. 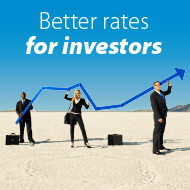 La Trobe Financial is one of Australia's leading independent credit specialist Fund Managers. Its business includes residential mortgages, commercial mortgages, and investment services operating one of Australia's largest Mortgage Funds under AFSL 222213. It employs over 150 staff and has managed over AUD$10 Billion covering over 100,000 investment grade assets since inception in 1952.